At the 2014 Salon International de l'Auto in Geneva, Switzerland, Hyundai Motor unveiled Intrado, a daring and provocative concept car that envisages how cars can engage and enrich lives. The show also marked the European debut of All-New Genesis, an executive sedan that clearly demonstrates the advanced capabilities of Hyundai. 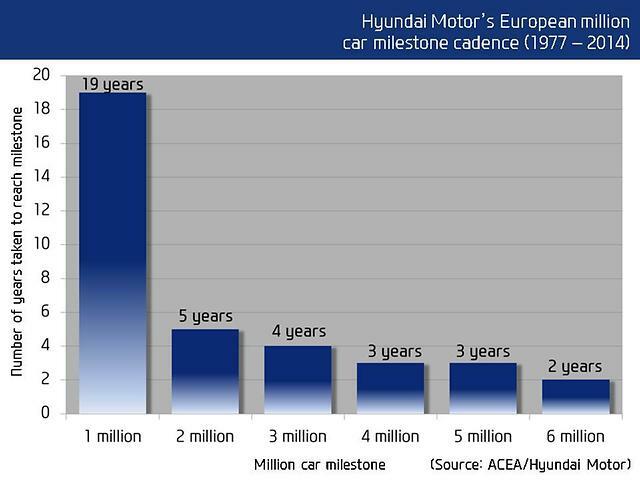 At the same time, the company announced it has sold six million cars in Europe, a landmark that was passed as Hyundai prepares for further growth during the second half of the decade. Intrado, unveiled at the Hyundai press conference at Geneva, shows the company’s optimistic vision of a future where mobility is more enjoyable and more relevant. Far more than a styling exercise, Intrado demonstrates Hyundai’s belief that advanced vehicle technologies and intelligent design can combine to engage more effectively with driver and passengers. The car’s use of lightweight materials, radical construction methods and advanced powertrain raises efficiency, while the design focus inside and out is on meeting the needs of consumers with busy lifestyles. Intrado takes its name from the underside of an aircraft’s wing – the area that creates lift. The car’s advanced materials and technologies also draw inspiration from aircraft, such as the removal of all unnecessary weight, logical solutions to complex challenges, inspired by a purity of purpose, and a highly efficient powertrain. The distinctive exterior shape of Intrado is dictated by the need to be aerodynamically efficient; it is free of unnecessary adornments and features minimal detailing. The body panels are made of advanced super-lightweight steel from Hyundai Motor’s steel plant. Its interior is defined by a focus on usability and adaptability, and draws attention to its advanced materials and radical construction. The seals of opening panels shut directly against the central carbon frame, showcasing the carbon fibre whenever doors, hood or trunk are opened. Components that are usually concealed are highlighted, including the ‘see-through’ air vents and exposed frame onto which the seats clip directly. The super-lightweight structure of Intrado demonstrates Hyundai’s desire to produce lighter, stronger cars that are even better to drive and simpler to repair. The central carbon frame structure is constructed using new manufacturing and joining techniques that together have the potential to change the way cars are made. The strength and rigidity of this central structure also allow body panels to be constructed from any material, giving designers greater flexibility and aiding repairability. Lightweight steel impact structures further enhance crash performance and repair times. Intrado is powered by a next-generation hydrogen fuel-cell powertrain that utilises a Li-ion 36 kW battery. Refuelled in just a few minutes, Intrado has a range of more than 600 kilometres and emits only water. In addition to increased range, Intrado promises more responsive and agile driving dynamics, thanks to the reduced weight and greater efficiency of its powertrain. The result of close collaboration between Hyundai Motor’s design and engineering teams in Europe and Namyang, Korea, Intrado was styled at Hyundai Motor European R&D centre in Rüsselsheim, Germany – as indicated by its codename, HED-9 (Hyundai Europe Design-9). Hyundai also worked with two preeminent carbon fibre producers. The parts supplied for Intrado by Lotte Chemical include the central beam, and the company’s unique carbon fibre reinforced plastic (CFRP) has been applied on the concept’s interior fabrics and exterior panels. Hyosung supplied its high-performance TANSOME® carbon fibre, considered to be among the world’s best in terms of strength and flexibility, for Intrado’s frame. Hyundai Motor has furthered strengthened its pioneering approach to design with an exclusive collaboration with European fashion house, HIEN LE. The futuristic designer’s latest outfits have been created to mirror key design themes of the Intrado concept car Intrado and made their premiere alongside the car at the 2014 Geneva Motor Show. HIEN LE has drawn inspiration from Intrado’s innovative yet functional interior, combining both of these characteristics to create a number of accessories that feature clean shapes and refined details. Intrado and HIEN LE together foresee a future where design enables a clean-sheet approach to the ultimate form and function of a car, only including what is of value and so fitting into the lifestyles of the ‘millennial generation’. Hyundai’s All-New Genesis made its European debut at the 2014 Geneva Motor Show. The executive sedan clearly shows Hyundai’s ability to introduce new levels of luxury and technology, and will be made available in limited numbers in Europe. Exceptional levels of standard equipment are matched to a calming interior and soothing ride, offering European customers an exclusive purchase proposition that focuses on refined performance and occupant well-being. Available in a single, high-specification form, All-New Genesis is powered by a potent V6 engine that delivers plentiful power and torque across a broad range of engine speeds, and works in harmony with a smooth 8-speed automatic transmission for refined performance. Driving pleasure and security is ensured by the new, in-house-developed HTRAC all-wheel drive system, sophisticated multi-link front and rear suspension and near-equal weight distribution. The generous accommodation provided includes levels of comfort and refinement never before seen in a Hyundai vehicle in Europe, and cossets occupants in opulent comfort. The interior uses fine materials to present a serene ambience, supported by advanced architecture that delivers superior refinement under all conditions. Intelligent design and thoughtful attention to detail have resulted in features such as the automatic trunk opening system, which can be activated even when both feet are on the ground. Extensive levels of standard comfort features are immediately and simply accessed, thanks to excellent ergonomics and easily comprehended design. The comfort-orientated suspension leaves occupants feeling fresh after even the longest of journeys. Occupants of All-New Genesis are protected and cared-for by a full portfolio of safety features that are both intelligent and unobtrusive. These include Smart Cruise Control, Automatic Emergency Braking and the world’s first C02 cabin sensor to avoid driver drowsiness. Showcasing the latest evolution of Hyundai’s design philosophy, fluidic sculpture, the sleek, clean styling of All-New Genesis hints at its technical capabilities and conveys its assured road manners. Also on the Hyundai stage at Geneva are: the world’s first assembly-line produced hydrogen fuel cell car, the Hyundai ix35 Fuel Cell; the Hyundai Motorsport i20 WRC rally car; and several of the brand’s i-range models, including added-value Go! Brasil special editions. Hyundai also announced that the company has sold six million cars to European customers since sales in the region began in 1977. The company has progressively increased sales momentum in the region in line with growing demand for its expanding European line-up of vehicles. It took the company 19 years to sell its first million cars in Europe. Since then it has taken less time to reach each subsequent milestone, with the last one million cars sold in just over two years. Hyundai intends to grow its European market share to 5 per cent by 2020, an ambition that will be supported by enhancements being made to the quality of its operations and a new wave of product launches entitled ‘Product Momentum 2017’. More than €3 billion of investment into commercial, R&D, testing, manufacturing and motor sport facilities has seen Hyundai become a truly European brand. Underlining the success of its regional investment, 95% of all cars Hyundai sells in Europe are designed and developed at the company’s European Design and R&D Centre in Rüsselsheim, Germany and 90% are built in the region at the company’s two production plants – in the Czech Republic and Turkey. Hyundai has also looked at enhancements to build a better known and understood brand. Long-term partnerships with iconic organisations including Tate and FIFA and UEFA are helping Hyundai to connect with a wider range of potential customers. The current Hyundai European model line-up includes New Generation i10, New i20, ix20, New Generation i30 and New ix35, all of which are built in Europe, as well as i40 and New Generation Santa Fe. Further information about Hyundai Motor and its products is available at www.hyundai.com .